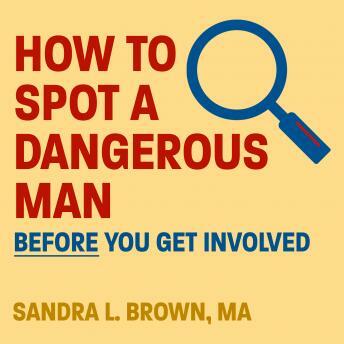 In How to Spot a Dangerous Man Before You Get Involved Sandra L. Brown, MA, describes eight types of dangerous men, their specific traits, and characteristics. She explores victim's stories that tell how they came in contact with each type of Dangerous Man and their outcome. Brown then presents how to develop a defense strategy-how to spot, avoid, or rid themselves of this type of dangerous man. Brown explains women's innate 'red flag' systems-how they work to signal impending danger, and why many women learn to ignore them. With red flags in hand, Brown then guides the listeners through their own personal experiences to develop a personalized 'Do Not Date' list. With these tools, Brown shows women how they can spot and avoid patterns of engagement with dangerous men.